Save the date: On June 26 and 27, 2018 Berlin will set the scene for powerful personalization and effektive pricing through artificial intelligence (AI) in omni-channel retail. prudsys AG, the leading provider for real-time personalization and pricing for retail, invites retailers and experts to exchange ideas about trends and innovation in the field of intelligent customer approach. 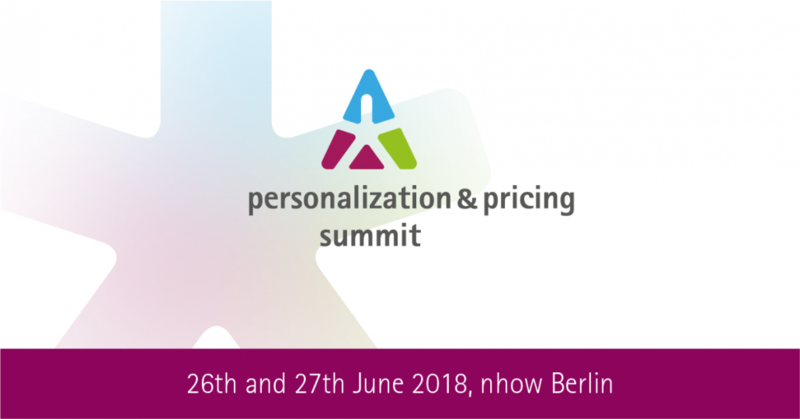 The personalization & pricing summit on June 26-27, 2018 at the nhow Hotel Berlin provides a platform for approximately 200 retailers and industry experts to give practical presentations and exchange information about the latest developments for successful personalization and pricing strategie. Numerous well-known retail companies will present their best practical examples of personalized customer approaches, highlighting the potential of artificial intelligence (AI) in the age of digital transformation. The focus here is firmly on the customer and customer needs, whether online, on the go or in retail stores. The “Personalization Award” will be given to a company selected by the expert panel to recognize an outstanding project implemented in the field of personalization. Some of the winners in recent years include 1-2-3.tv, bonprix, KLiNGEL Group and Thalia. In addition to a complete conference program for a successful personalized customer approach both in e-commerce and at point-of-sale, participants can look forward to a panel discussion, in-depth workshops and an interactive showroom featuring examples of practical applications. The focus once again this year will be also on the best solutions of the preceding “DATA MINING CUP 2018”. Every year, hundreds of student teams take part in the challenge of solving a problem in the field of intelligent data analysis. Further information and a video review of pps 2017 under summit.prudsys.com.